The cancer centre of AZ Groeninge, Kortrijk, is actively combating cancer. In order to make the lives of oncological patients more bearable they would like to buy additional scalp coolers. depends on the product used – a scalp cooler can reduce or even prevent hair loss by cooling the scalp before, during and after chemotherapy. 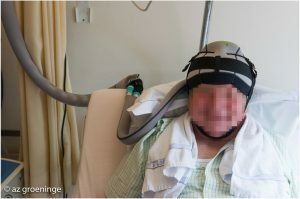 The scalp cooler “freezes” as it were the scalp, which reduces the control of the chemo. The first 10 minutes the cooler feels a little unpleasant but afterwards the scalp is anaesthetised and the patient doesn’t feel the cold anymore. Please mention Scalp Cooler Project. Groupe de parole pour les femmes : "Revenir au travail après la maladie"
Book launch and cake sale.